Almost every Wednesday I take my cherub to Spanish story time at El Pequeno Artista in South Park Slope. Or is it Greenwood Heights? Or is it really Sunset Park? Anyway, it's on 20th Street. In the winter, the bus ride was pretty quick, but it costs $4 round-trip (does anyone else remember the days when you could take the same bus in different directions on the same swipe? ), and I didn't get my much needed exercise and fresh City air. Walking is free and much more entertaining. 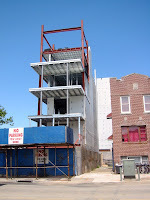 I was also able to admire the progress on another building going up across from the cemetery. It's slow-going, it seems. I've been watching it a while. I can't tell if they plan on putting another floor on. However, the L shape makes sure to block lots of annoying sunlight from entering the surrounding homes. I guess the success of the condos next door (the garden terrace on the top floor was recently featured on Brownstoner.com) has encouraged the taller version. 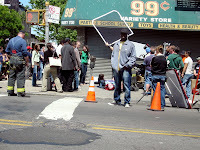 Another few blocks brought us to the set for Rescue Me in the middle of filming a scene featuring a woman giving birth on the street. Super original! I guess they are doing the sound at a later date, or maybe she's a Scientologist who has to do a silent birth. I didn't hear any groaning or screaming or cursing, so it must be one of the two choices. 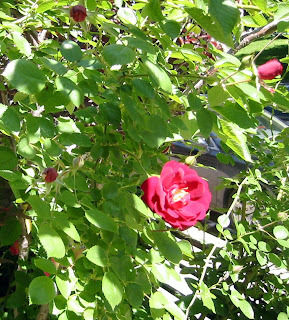 And finally, on this surprisingly low-on-garbage-in-the-street day, I found that my neighbor's roses have begun to bloom. 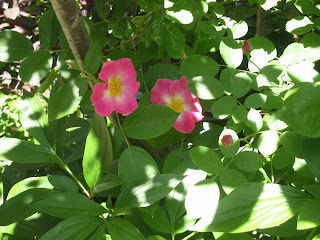 Every year I've enjoyed passing these roses. Many of the other passers-by do as well. So me come with scissors or knives so they can enjoy them longer. Makes for a flowery end to a very pleasant walk.